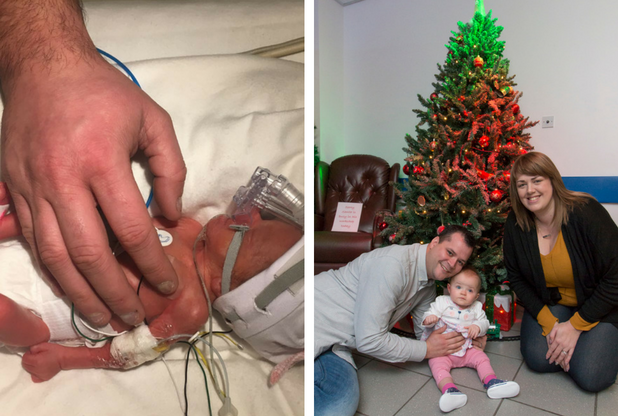 She was their Christmas miracle, the tiny baby girl covered by her father’s hand. Ava Curwood was delivered by emergency caesarean section 10 weeks before her due date after she stopped growing in the womb. She weighed just 1lb 7oz. She was rushed to Hull Women and Children’s Hospital from Diana, Princess of Wales Hospital, in Grimsby when she was just two hours old and staff at Hull’s neonatal unit battled for more than a month to save her life. Now, after celebrating her first birthday on December 19, Ava is a bouncing baby girl of 19lbs 5oz after being discharged by the paediatric team last month. Mum Briony, 27, said: “I asked if she would survive and they told me to take it hour by hour. Then it was week by week. “But she was an absolute trooper and, to look at her now, you would never know all she had been through. Briony and husband Mike, an oil engineer, tried for a baby for almost two years before they discovered they were expecting Ava. After a fall in the kitchen when she was 29 weeks pregnant, Briony went to the Grimsby hospital for her baby’s movements to be monitored. Accompanied by her dad Andy Holmes, she went for a scan which showed her baby had not grown since 21 weeks. “They told me I’d to prepare to give birth either that day or the next morning,” she said. “I was excited at first because I thought I was going to see my baby. I didn’t know anything about prematurity as we always had 10lb babies in my family. 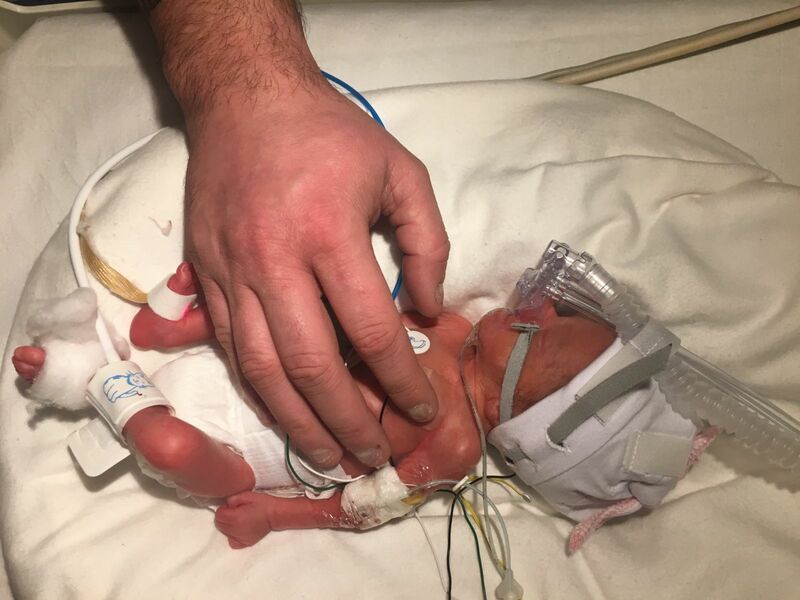 Whisked up to the labour ward, further monitoring showed Ava was in life-threatening distress and had to be delivered immediately, minutes after Mike arrived at the hospital. Within two hours of her birth, she was on her way to Hull while her mother recovered from major surgery. For the next few days, Mike shuttled breast milk from his wife to feed his daughter over the Humber Bridge, staying by his daughter’s beside in Hull where he was originally from and where his family still live. Briony was eventually reunited with her daughter after four days, when she was well enough to make the journey to Hull. “She didn’t look like a baby,” she said. “She looked just like a little doll. Her ears hasn’t come out of her head properly. But survive she did. Within 24 hours, Ava was breathing unaided. Within three weeks, she was well enough to be transferred back to Grimsby and then allowed home when she weighed 4lbs 3oz. Ava has cleared every developmental milestone and was discharged from paediatric services in November. 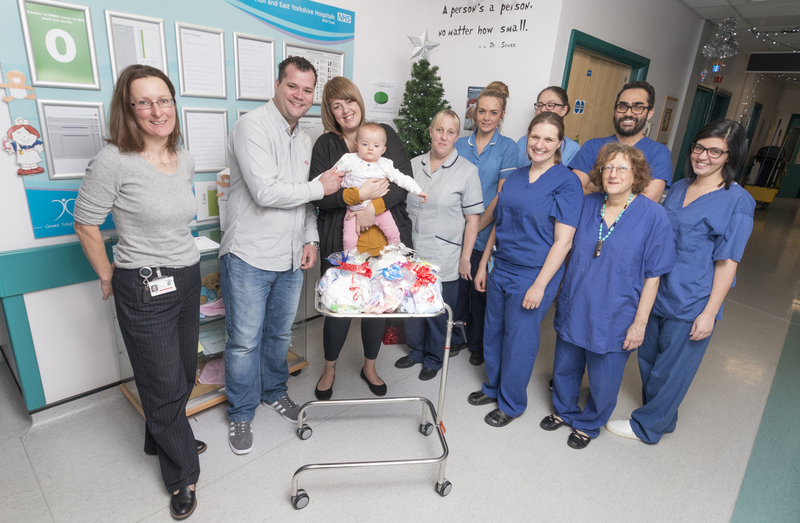 The family has since returned to the neonatal unit to deliver Christmas presents, including tiny babygros for premature babies, as a way of thanking staff. 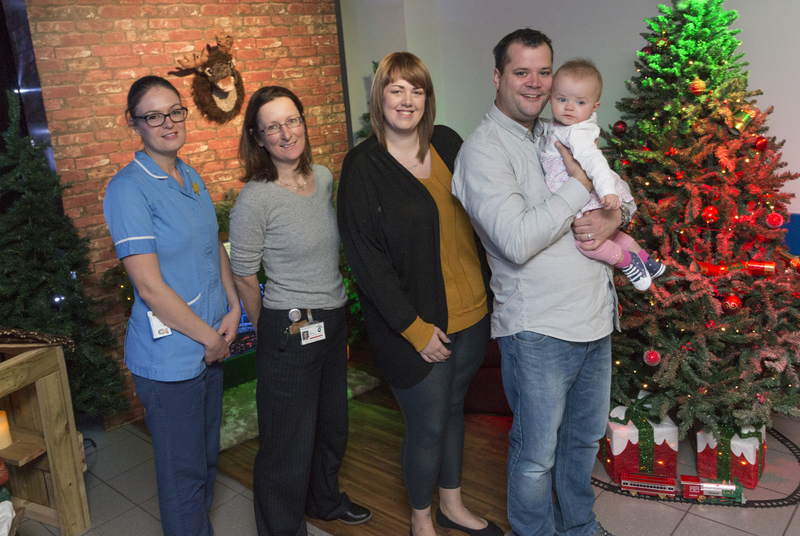 Her parents told us they planned to mark her first birthday on December 19 with a family party at their home in Curzon Court, Cleethorpes, sure to feature Ava’s favourite Peppa Pig cartoon, and the family intend to spend Christmas with their relatives. Consultant Dr Chris Wood, the trust’s paediatric clinical director, said: “It’s great to see how well Ava is doing. “Our dedicated and skilled staff do our absolute best for every baby brought to the unit.